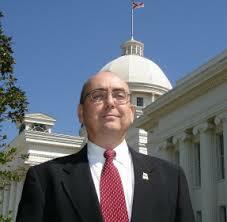 Larry Darby is a practicing Alabama attorney, founder of the Atheist Law Center and former state director of American Atheists (he was forced to resign when he invited David Irving to speak), as well as a runner-up candidate for Alabama Attorney-General in the 2006 Democratic Party Primary. That campaign started to flail when Darby began questioning the veracity and scale of the Holocaust (less support from some quarters; more from others). He also wanted to “reawake white racial awareness”. Specifically, Darby questioned the number of Jews who died during the Third Reich (suggesting around 140,000, but that many of those succumbed to typhus rather than systematic murder). I don’t know what it tells you about Alabama that he got pretty close to winning the primary, but one suspects that it may not have been because of his atheism (indeed, he claims to have converted to Christianity later on in the process, blaming his fellow atheists’ penchant for jumping onto the “Judeo-Marxist” bandwagon). Darby even agreed to the term Holocaust denier: “I am what the propagandists call a Holocaust denier, but I do not deny mass deaths that included some Jews,” a comment upon which he elaborated with “there was no systematic extermination of Jews. There's no evidence of that at all.” Apparently the “millions of deaths” claim originated instead with “the Holocaust Industry”. You can review more of Darby’s breathtaking conspiracy theories here. He has also declared that the United States is undergoing a “Mexican invasion” – that one is a common one, but Darby added some personal flavor by comparing the current immigration to the 1960s civil rights movement since both were events that in Darby’s eyes have hurt the South. To deal with the immigrant situation Darby suggested bringing the Alabama National Guard back from Iraq because “they're fighting for Israeli interests and not for Alabama or the United States’ interests,” and rather deploy them to ferret out illegal immigrants. If elected he said he would ask for the governor to declare martial law “so we could act freely and stop the illegal immigrants from crossing our border.” Apparently he didn’t mean immigrants from Mississippi, but if he didn’t it is a little unclear which border he was referring to. Diagnosis: An amazing character; that he managed to achieve some limited but significant popularity in Alabama – even despite his atheism – tells you something about something.